Another retail building is officially underway with a commemorative ground breaking ceremony today marking the start of construction. Sugar Maple Crossing at the corner of Highway 53 and Sugar Maple Drive began work last week on the next phase of their development, a 5,000 square foot retail building towards the very front of the site. We've been discussing the project for the last few months with Stevie Paulson who is one of the developers behind the project. The 5,000 square foot retail building is part of the larger 27,300 square foot development that was originally planned for three phases but will now be completely finished within the second phase due to pure success. We'll have more information regarding the new office component later this week. Above: Retail building to be constructed housing Burger King and an additional tenant. Burger King will occupy roughly approximately 3,200 square feet of space within the new retail building. They will abudt the portion of the building closest to Highway 53 and will also feature a drive thru. Burger King is working with Platinum Properties on an exterior design that will mesh the surrounding developments design with Burger King's newest prototype. It will technically be the fifth Burger King location in the area. If we look back at the reign of Burger King you'll notice a bit of a downsizing and a retreat to the backlines in their presence in the Duluth area. The area originally had six locations and now that number sits at just three. While the location on London Road is undergoing a rebuild, the location in the Miller Hill Mall along with the Canal Park location closed in the early 2000's. 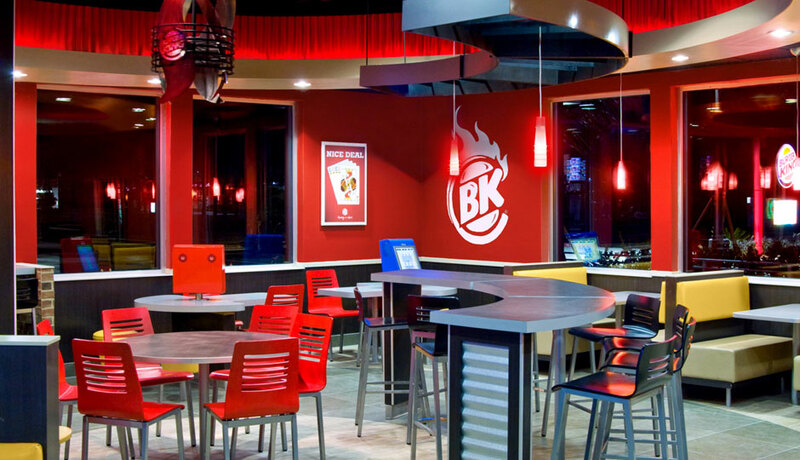 Above: Interior of the new Burger King prototype which could be featured at the new location in Hermantown. Back in May 2013 GNT development bought all the Burger King locations in the area. Their plan was for an entire revamp of the brand including renovations to all locations and the additions of multiple new locations within the area. It appeared that Burger King was going to make its come back and that McDonald's would finally feel the heat from its competitor re-entering the Northland has a viable player in the burger industry. Last year we saw significant renovations occur at both Duluth locations, the most substantial being at their Central Entrance location. Then in last fall it was announced that Burger King would rebuild their London Road location in order to accommodate a new prototype and additional retail space for a Caribou Coffee location (read about that development here). The new location at Sugar Maple Crossing will be roughly the same size as the new location being constructed on London Road. Construction on the retail building that Burger King will be housed in will happen at a rapid pace. The hole for the building has already been dug and footings will be poured next week. "Our goal is to have a roof on by October 20th" Stevie explained to us which means walls will begin to rise early next month. An opening for Burger King could be seen as soon as early December with some sources saying by December 1st; we were assured by Paulson that they "will open by the end of the year" regardless. Sugar Maple Crossings will announce an additional tenant for the retail building in the coming week. All we know at the moment is that the additional retail space will house a eat-in restaurant of some sort. The brand currently does not have a presence in Hermantown but does in the greater metro area. Above: Burger King's new exterior prototype. Elements of this design will be featured in the Hermantown location. The announcement for Burger King and the additional restaurant will mark three openings for the development in the coming months. Dickey's BBQ Pit will also open next month (you can read about it here) in the first phase of the Sugar Maple Crossings. Kwik Trip will also open across the street in early October. As always, check back to CDINDULUTH in for the latest in development news regarding Sugar Maple Crossings and the entire Duluth area!